Robert Pattinson enjoys a night on the town in Budapest. Ever the gentleman, he stopped to pose with 3 fans on the street. Unicorns come out at night! 16 Responses to "Photos: Robert Pattinson enjoys a night on the town in Budapest"
just i want to be in Budapest!! I prefer this over a top hat and tux any day or night. Aww…bless he looks tired…Poor baby is working so hard, It’s about time he had some fun! you may would like to credit the original source at pattisonlife livejournal and add the info that the pics are from last weekend,not new. Pattinsonlife *is* credited, as is RPLife. I agree flannel Rob rules!!! Poor baby! He is working so so hard!! What he needs is some good old bed rest, i have a bed available for you Rob anytime! Lol! Love Beanie Rob! And what do you think, girls? Is that the plaid from Comic Con? The holy t-shirt is definitely the same one he wore for the Remember Me Facebook spots (as well as several other occasions – I actually did a post about it – LOL!). Oh I love his lips, so cute. He is adorable, so affectionate with his fans. 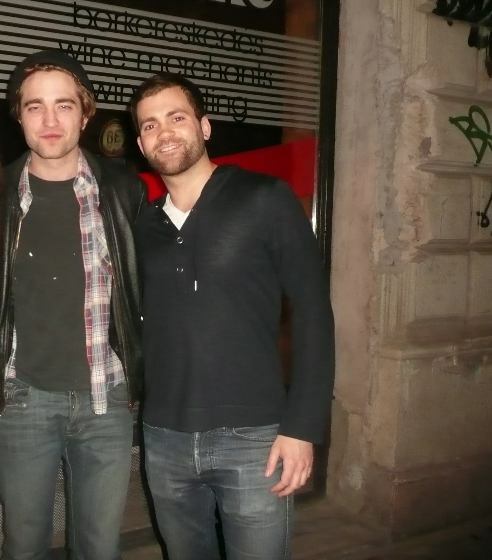 I love beanie Rob in Budapest. He deserves to have fun. the photo looks strange!!!! !His face, smile as well eyes are exactly the same of the 3 pictures!!!! uhuhuhuh not nice i can’t belive he has the same expression!!!! FlannelBeanieButtonFlyBudapestRob looks as yummy as ever!I love how he always takes pics w/fans now and he actually smiles. He looks a little glazed over and drunk here, but that’s our Rob!! Love him! !